Abe, Xi agree to boost bilateral ties to mark friendship treaty anniv. Japanese Prime Minister Shinzo Abe and Chinese President Xi Jinping agreed Wednesday to improve bilateral ties further as this year marks the 40th anniversary of the signing of a bilateral peace and friendship treaty. Aiming to bring closer the two regional powers whose ties have often been frayed by issues related to territory and history, the leaders expressed their willingness to promote high-level reciprocal visits. Abe said he and Xi confirmed in their talks on the sidelines of a regional economic forum that their countries will accelerate arrangements for his visit to China next month, with the Chinese leader welcoming the plan. The Japanese premier is looking to celebrate in China the anniversary of the peace treaty, which took effect on Oct. 23, 1978. "We would like to establish peace and prosperity in Northeast Asia by leading the bilateral ties to a new stage through leaders' reciprocal visits," he told reporters after the summit in the Russian Far East port city of Vladivostok. If realized, it would be the first visit to China by a Japanese leader since December 2011, apart from trips to attend international conferences. The two leaders also confirmed their close cooperation toward the shared goal of denuclearizing North Korea, with negotiations between Washington and Pyongyang having reached an impasse. Abe, whose tenure as president of his ruling Liberal Democratic Party is set to expire at the end of this month, is widely projected to win the leadership race on Sept. 20 and remain in power afterward. Deputy Chief Cabinet Secretary Kotaro Nogami, who briefed reporters, said Xi said he will give consideration to Abe's invitation to Japan. Tokyo hopes Xi will come to Japan on the occasion of the summit of the Group of 20 advanced and emerging economies in Osaka in June next year. During their 40-minute summit, Abe and Xi confirmed the necessity of implementing U.N. Security Council resolutions on North Korea to realize the "shared goal" of prompting the country to give up its nuclear weapons and ballistic missiles, Nogami said. China is one of the five permanent members of the panel. Xi also expressed Beijing's support for Tokyo to settle the issue of Japanese nationals abducted by Pyongyang in the 1970s and 1980s, according to the government spokesman. The Japan-China summit comes amid a deadlock in denuclearization talks between the United States and North Korea following their leaders' historic summit in June. China is a traditional ally of the North and Xi has met with North Korean leader Kim Jong Un three times this year. 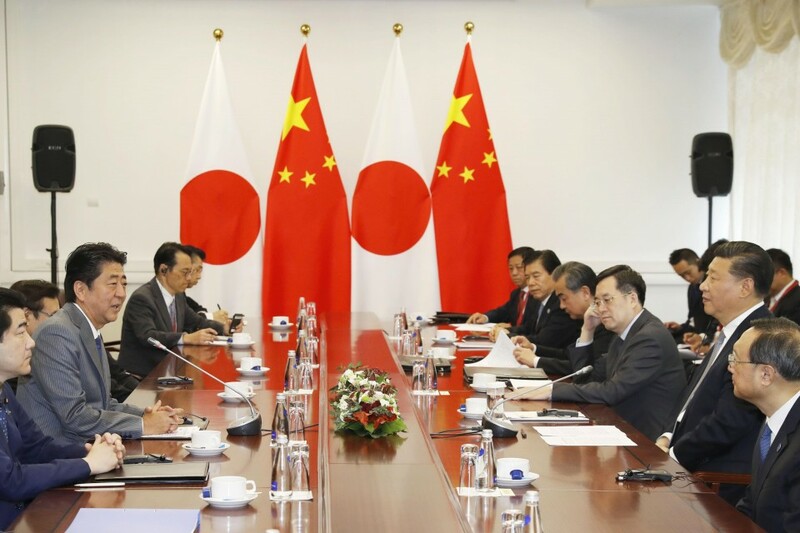 On the economic front, the Japanese and Chinese leaders reaffirmed their cooperation for promoting the Xi-led "One Belt, One Road" cross-border infrastructure initiative. Japan and China are expected to hold a meeting in late September in Beijing aimed at laying out specific infrastructure projects in third countries under China's "One Belt, One Road" initiative. Amid growing concerns about protectionism policies by U.S. President Donald Trump, Xi stressed the importance of free trade without mentioning an escalating trade war with Washington, according to Nogami. Tensions between Japan and China escalated especially after the Japanese government under the now-defunct Democratic Party of Japan led by former Prime Minister Yoshihiko Noda effectively put a group of uninhabited islands in the East China Sea under state control in September 2012. 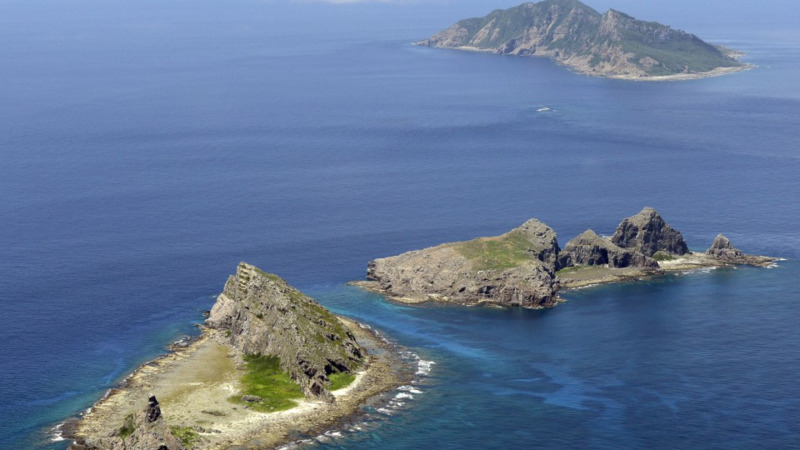 The islets controlled by Tokyo, but claimed by Beijing are known as the Senkaku Islands in Japan and Diaoyu in China. But the bilateral relations have recently shown signs of improvement. Chinese Premier Li Keqiang visited Japan in May, the first visit by a Chinese premier in seven years, to attend a trilateral summit also attended by South Korean President Moon Jae In.